Ilan Baum is on detached duty from Mossad, where he was a field counter terrorism agent for several years. Previous experience in close surveillance, SIGINT gathering and analysis, and military police. He continues in the field counter terrorism role for Consular Ops. Baum is a team player, honest, and loyal. He does not enjoy violence, but accepts it as necessary and justified in the face of a brutal enemy. 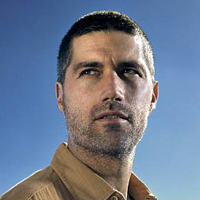 Baum is a native-born Israeli. His parents, who live near Tel Aviv, were originally from the US and France. He is the youngest of three brothers, and has a younger sister. He has several nieces and nephews. His family thinks he left the military to take a well-paid but very travel intensive job as a translator. He has colleagues at Mossad who know he is still active, but only his handlers and other Mossad agents with the same duties know he is with Consular Ops. ST 11 ; DX 16 ; IQ 12 ; HT 11 . Damage 1d-1/1d+1; BL 24 lb; HP 11 ; Will 12 ; Per 13* ; FP 11 . Basic Speed 7.25† ; Basic Move 7 ; Dodge 11‡. Languages: Arabic (Accented) ; English (Accented) ; French (Accented) ; Hebrew (Native) . Combat Reflexes ; Craftiness 4 ; Extra Basic Speed +0.25 (Affects Speed) ; Extra Perception 1 (Affects Per) ; Intelligence Rank 2 ; Luck ; Patrons (MOssad; 9 or less) . Callous [-5]; Code of Honor (Professional) [-5]; Duty (Mossad/ConsOps; 15 or less (almost always); Extremely Hazardous) [-20]; Fanaticism (Israel) [-15]; Intolerance (Muslim Extremists and Sympathizers; One group) [-5]; Overconfidence (12 or less) [-5]; Restricted Diet (Vegetarian; Very Common) [-10]; Sense of Duty (Team; Small Group) [-5]. Acrobatics (H) DX-2 -14; Acting (A) IQ+3 -15§; Administration (A) IQ-1 -11; Armoury/TL8 (Small Arms) (A) IQ -12; Camouflage (E) IQ+4 -16§; Climbing (A) DX-1 -15; Computer Operation/TL8 (E) IQ -12; Current Affairs/TL8 (Politics) (E) IQ+1 -13; Driving/TL8 (Automobile) (A) DX-1 -15; Fast-Draw (Pistol) (E) DX+1 -17‡; Forced Entry (E) DX -16; Garrote (E) DX -16; Guns/TL8 (Pistol) (E) DX+1 -17; Guns/TL8 (Rifle) (E) DX+2 -18; Guns/TL8 (Submachine Gun) (E) DX+1 -17; Holdout (A) IQ+4 -16§; Intelligence Analysis/TL8 (H) IQ-1 -11; Interrogation (A) IQ -12¶; Judo (H) DX-1 -15; Karate (H) DX-1 -15; Knife (E) DX -16; Observation (A) Per+1 -14; Parachuting/TL8 (E) DX -16; Photography/TL8 (A) IQ -12; Search (A) Per -13; Shadowing (A) IQ+4 -16§; Soldier/TL8 (A) IQ-1 -11; Stealth (A) DX+4 -20§; Tracking (A) Per+1 -14. * Includes +1 from 'Extra Perception'. † Includes +0.25 from 'Extra Basic Speed'. § Includes +4 from 'Craftiness'. ¶ Conditional +1 from 'Callous' when you use threats or torture. This page was last edited on 5 January 2019, at 22:25.